Discussion in 'Chez Ziggy' started by bbinder, Jan 10, 2016. Large Squirrel, VickiK, MattL and 5 others like this. I have never owned a cat, but have been closely connected with a couple. The gray ones ... they're my weakness. Wendy, MattL, Lorenzzo and 1 other person like this. THIS was exactly the smile I needed tonight! VickiK, Lorenzzo, AmyPJ and 1 other person like this. 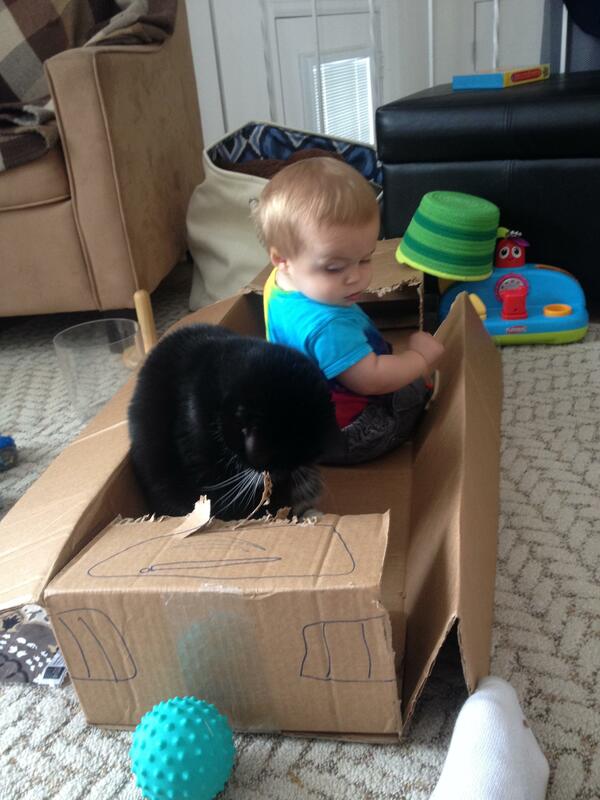 Cats really are so funny. We left an unfinished Monopoly game out last night, and our 18 year old (yes! she's that old!) cat started playing with the pieces across the wood floor at 5am. I was both amused and not amused at the same time. This is the same cat who weighs all of 8 pounds and will corner the biggest dogs if they come in the house. AND she's declawed. VickiK, slowrider, RachelV and 6 others like this. Cuteness! The cat is eating the shreds so they can barf them up later. gardenmary, newboots and RachelV like this. VickiK, MattL and AmyPJ like this. VickiK, Tricia, newboots and 1 other person like this. 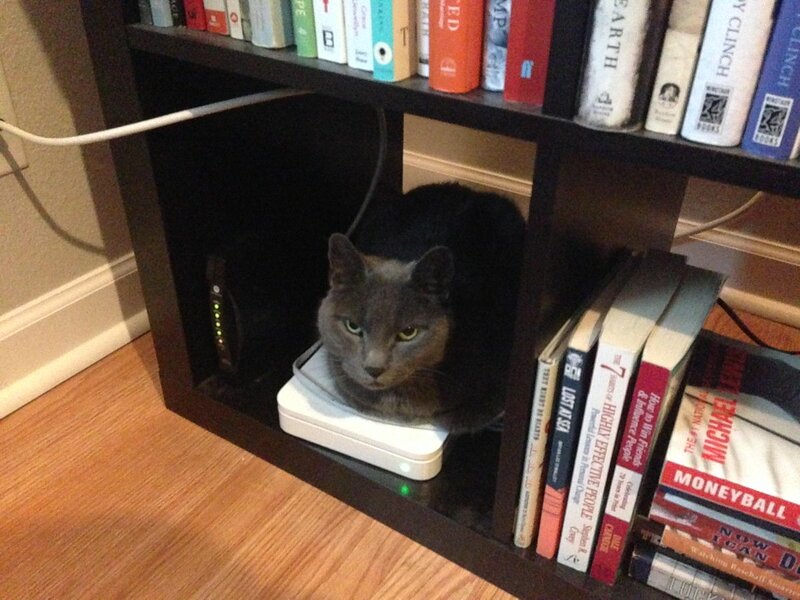 How about cat on a router? Once it gets below about 66 in my condo, this becomes Kitty's favorite sleeping spot. Yesterday I was gchatting with a friend, the internet went out, and a few minutes later I said, "Sorry, my cat unplugged the router." John Webb, Wendy, Large Squirrel and 8 others like this. Haha that LOOK! Like if EVEN try to kick me off my warm spot, I'll scratch your eyes out! I'm one of those who happens to love the F you attitude that cats often possess. As long as they aren't truly mean, which I have found most aren't. RachelV and Warp Daddy like this. She is a chronic box eater. She doesn't actually eat the cardboard, but her mission in life is to rip it to shreds. Boxes don't last too long in our house because soon the floor is covered in little kitty bite sized pieces of cardboard she has torn off and spit out. Large Squirrel, VickiK, newboots and 4 others like this. "Hey, why'd you go wake us up?!" Or, "can't you see we were having a moment?!" Or...if you'd turn the damn heat up we wouldn't have to resort to this. Pfft, they'd to it anyway. Cats like it about 90 degrees, I swear! Hence, the "sun deathray". Mine never did care for each other, though, so no cuddling occurred. I was shocked they were this close together. I had to have the black one put to sleep in the fall. I sure miss him. He was an absolute hoot. Warp Daddy and MattL like this.